Nitrile Surgical Gloves are intended for use in environments within hospitals and other healthcare facilities. The gloves are appropriate for use during invasive and non-invasive medical procedures requiring sterility. They are intended to be worn by operating room personnel to protect a surgical wound from contamination. 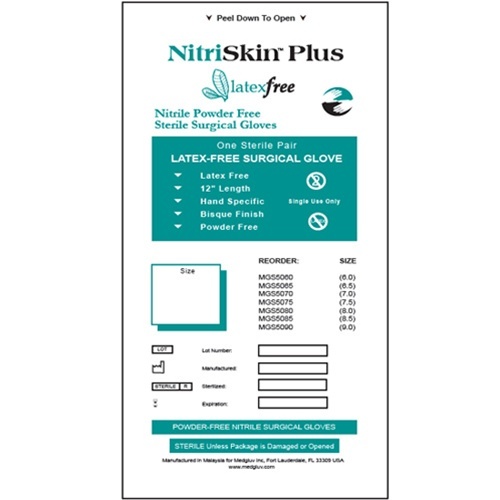 The NitriSkin Plus Nitrile Surgical gloves contain no natural rubber latex proteins. The soft, highly elastic formulation provides the maximum in comfort, fit, and protection, while offering exceptional tactile sensitivity. Hand Specific. Textured Finish. 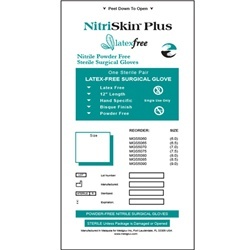 These nitrile synthetic surgical gloves contain no natural rubber latex proteins. Quantity: 25 Pairs/Box, 4 Boxes/Case (1 case = 200 gloves / 100 pairs).